Though “Fire and Fury” has caused just that among news networks, it is not because of the brilliance of the author, but rather his ability to capture the comments by former Trump advisor Steve Bannon that seemingly question the mental ability of the President. Now, billionaire investor Tom Steyer has made the claim that he has purchased 535 copies of the book so he can have them hand-delivered to every member of Congress. Apparently this member of the “one-percenters” believes it will lend some credibility to his recent campaign to impeach Donald Trump. Look, we are wasting our time talking about the mental ability of a man who won against seventeen incredibly brilliant and capable people, taking down both the Bush and Clinton dynasties as well as the entire major media complex with its estimated 90% negative coverage, and finally overcoming billions of dollars in special interest money working against him. Let’s talk about something that matters. More specifically “a book” that matters. The book that has spawned the greatest healthcare, childcare, education, disaster relief, housing, and anti-slavery systems the world has ever seen. That book happens to be the top-selling book in the world and in America. It is a book that so heavily influenced the inception of our current Constitutional government that our founding fathers required government action to make sure it would remain a mainstay and place of prominence in American life in the colonies: the Bible. You see, during the Constitutional framers’ era, printers in the American colonies were prohibited from printing any English Bibles by governmental decree. Only three British printing establishments were allowed to do so. As a result, when the American Revolution began, the supply of English Bibles to America was cut-off. Distressed about the shortage in July 1777, the Continental Congress responded to a request placed before it by three clergymen: Francis Alison, John Ewing, and William Marshall. So urgent was the matter that Congress took up the request from the three clergymen the same day—Monday July 7, 1777— and appointed Daniel Roberdeau, John Adams, and Jonathan Bayard Smith as a committee to look into the matter. The conclusion of the committee? Whereupon, Congress agreed with the committee, and ordered twenty thousand copies of the Bible to be imported. America’s Founding Fathers, both publicly and privately, were advocates of the distribution of the Bible. Many of these founders worked and financed Bible societies after the establishment of the government of their new nation. 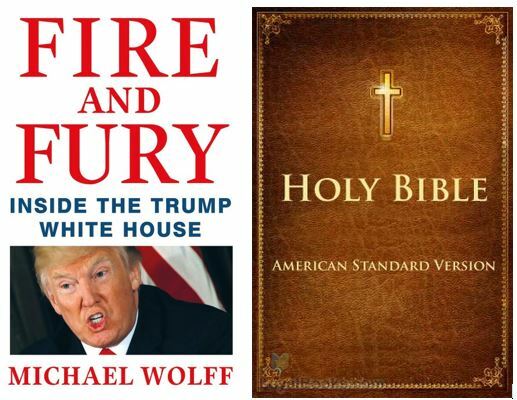 While many current members of Congress might believe “Fire and Fury” be worth the fire, I cannot find one founder in all my research who would denounce the efficacy and importance of the Bible.